Interested in delivering an awful professional development session? Of course you aren’t! But we’ve all attended a bad PD session before, haven’t we? Trapped in a room for multiple hours on end, no escape strategy, and wondering: “How is this supposed to help me become a better educator? Is this really the best use of my time right now?” You probably left thinking, I would never deliver a PD session like this. But, just for kicks, let’s say you really want to deliver a bad professional development session of your own. Like, epically bad. Where should you start? Here’s some super awful tips to help you on your way! 1. Talk for three hours in the front of the room. This is crucial – if you want to deliver a spectacularly bad professional development session, I have three words for you: Really. Long. PowerPoint. Seriously, add 150 slides and read off of them verbatim. Everyone in the room knows you are the authority on the subject – and if they don’t, they will by the end of the session. Why? Because you made a slideshow with some wacky transitions and 7,000 bullet points to prove it! Your expertness will clearly ooze into the teachers, and if it doesn’t – that’s the fault of the attendees for not paying attention. 2. Be as boring as possible. 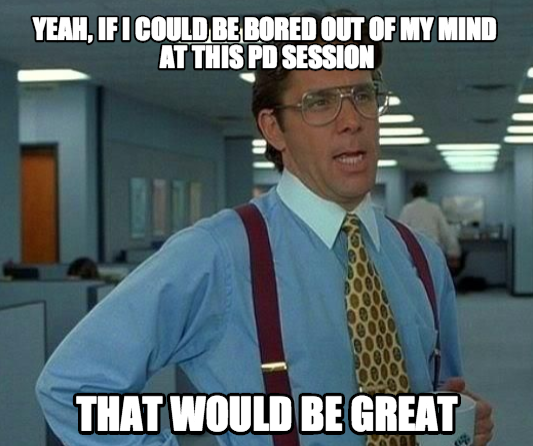 PD is supposed to be boring, so make it boring! Like unicorns and leprechauns, having fun while learning is a myth. NO ONE WANTS TO HAVE FUN WHILE LEARNING. Real learning is the equivalent of completing a marathon – only the ones that can gut it out and fight through the pain deserve to finish. So dump a bunch of handouts on the teachers, clear that monotonous speaking voice of yours, and start that bad PD session off with a bang that’s as dull and boring as possible. 3. Don’t have your attendees do anything. Dutiful listening is the sign of a true learner. Are you considering putting your attendees into groups and giving them stuff to do? Considering differentiation? Maybe you’re thinking about asking them to bring laptops/tablets so they can find, access, create and share? Perhaps you’re thinking about opening up a back-channel through Today’s Meet or a Twitter hashtag? STOP RIGHT THERE, JOHN DEWEY. The moment you treat your attendees like contributors and give them technology access, they are prone to zoning out, getting off-task, or FLAGRANTLY SHOWING UP YOU, THE PRESENTER! Remember, you are the expert here. Quality PD is like training a puppy: you need to establish dominance from the get-go. Once you give up control there is no telling what could go wrong in your session. 4. Make ZERO connections to practical teaching and learning. Want to know why you’re the expert? Because you make complicated connections that the serfs and peasants are unable to make themselves. Making practical and honest connections to what’s going on the classroom is one of the WORST things you can possibly do, because this is a sign of losing control. I repeat: YOU WILL LOSE CONTROL OF THE ROOM. And this can’t happen – you still have 172 more PowerPoint slides to read! 5. Lead your session the OPPOSITE of how you would teach a classroom of students. You might be thinking – “Wait a minute, hold on. Don’t people typically learn by doing? Don’t good teachers offer students authentic outlets for creation and collaboration? Don’t good teachers promote innovation in the classroom and provide all students a voice in their learning? Shouldn’t I, you know, model good teaching in a PD session about teaching? If I didn’t, that would be pretty ironic, right?” You’re thinking too hard about this. Just stop. Get back to that PowerPoint. Those slides won’t transition themselves. Previous Post What is Mystery Skype?